After walking for less than a kilometer from Sovabazar Metro Station, I enter the labyrinthine lanes of Kumartuli, stopping only after I get a glimpse of “Mahishasurmardini” (the demon-slayer Goddess) shielded behind a clear tarpaulin drop sheet. 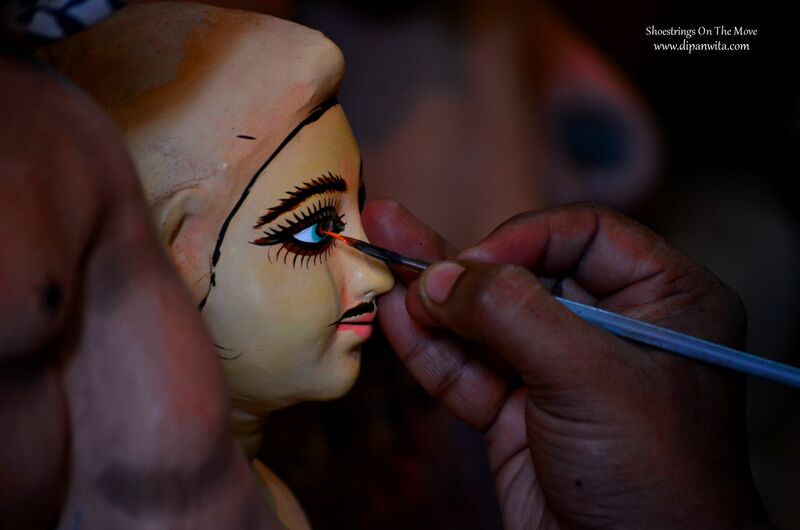 Kumartuli literally means Potters’ colony in Bengali, where “Kumbhar” means sculptor and “tuli” means colony. 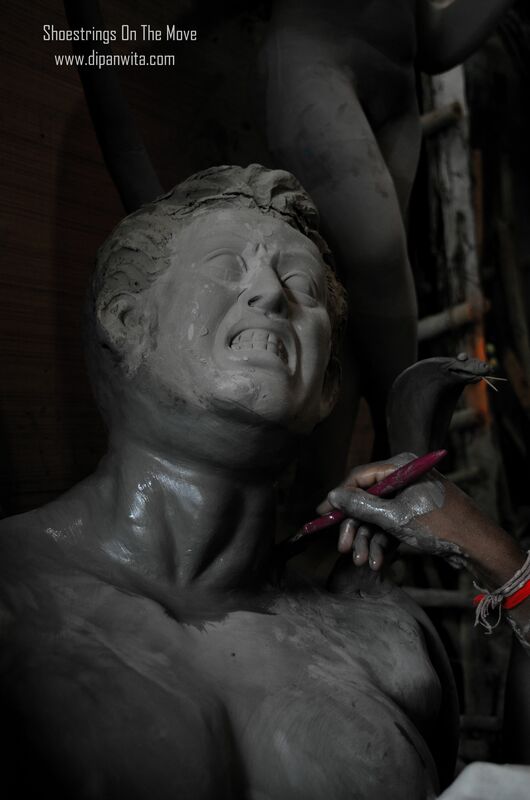 Nestled on banks of the Hooghly, Kumartuli is centuries- old neighborhood in North Kolkata, famous for carrying on the 300 year old tradition of crafting clay idols of deities with innovative designs and excellent quality. 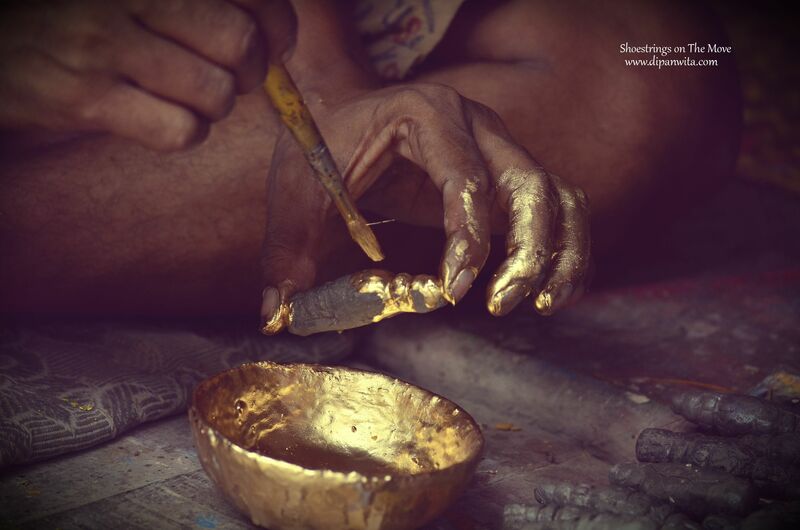 It is home to some of the finest clay-artisans in India. 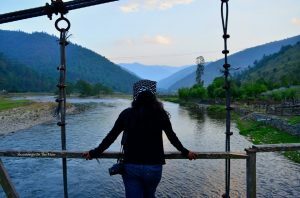 This makes the place most sought after location for art lovers and photography enthusiasts who keep hopping here couple of months before the start of Durga Puja. I was informed by fellow blogger, Subhadip Mukherjee about the requisite photography permit and hence, started looking out for whereabouts of the “Shilpi Samiti” (artist council) that issued permits.It turned out that I had reached early and needed to wait for another hour till the permit office opened. I had no choice but to strut along the lanes and bylanes. I opted to sit at a nearby tea shop and start my day with “Bharer Cha” (Kulhad chai) before I set my wandering feet out. Durga Puja is the grandest of the festivals in West Bengal. The autumn festival starts with Mahalaya, marking the advent of “Devi Paksha” and the day of “Chokkhudaan” when senior most artists draw eyes of mother Goddess. This is the most auspicious day and the artisans either fast or eat pure vegetarian food one day before chokkhudaan. The main Puja starts from the 6th day of Navratri, called Maha- Shashti with Bodhan or Avaahan (awakening of the Divine Mother) and continues for 3 days, namely- Maha- Saptami, Maha- Ashtami and Maha- Nabami. The last day, Vijaya Dashami is farewell day where the Goddess is bid adieu and idols immersed in the Ganga. 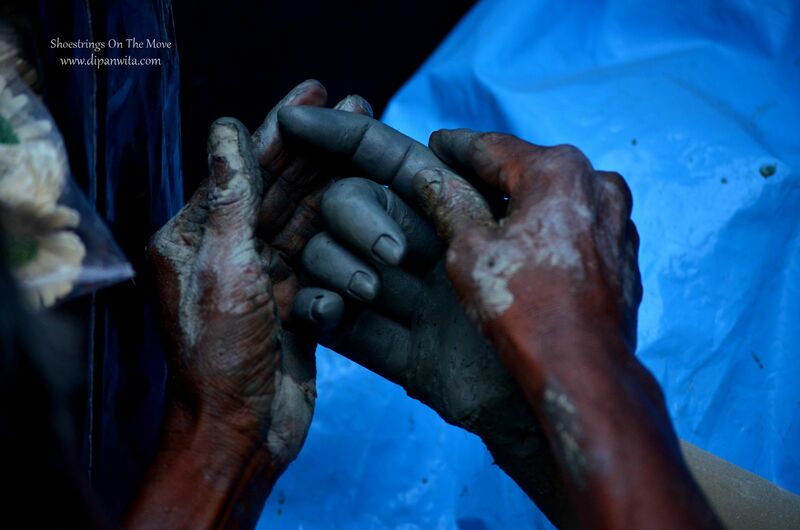 Just outside the tea shop, a mound of clay is watered, mixed with rice husk and pounded by an artist by feet. This clay, I am told, will be added to the straw and bamboo frame to give proper shape to the idol. This clay is called the “path maati”, a mixture of clay from Ganga and straw particles. The basic frame of the idol is made of bamboo and straw, which is further prepared with “path mati”. 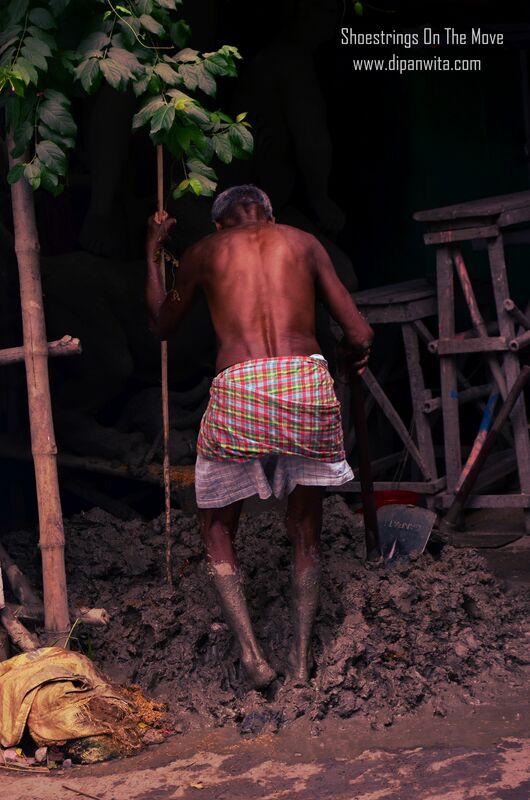 The head, feet and palms are taken care of by the senior most artisans. They are created separately and are later attached to the torso of the idol on the stage. I meet Amit Karmakar, who issues my photography permit worth INR 50 which is valid for an entire season and allows numerous visits to Kumartuli. He happily guides me through the list of best workshops of the colony and introduces me to Rakhal Pal, another artist whose family had been into idol making since many generations. Inside his workshop, it is business as usual. 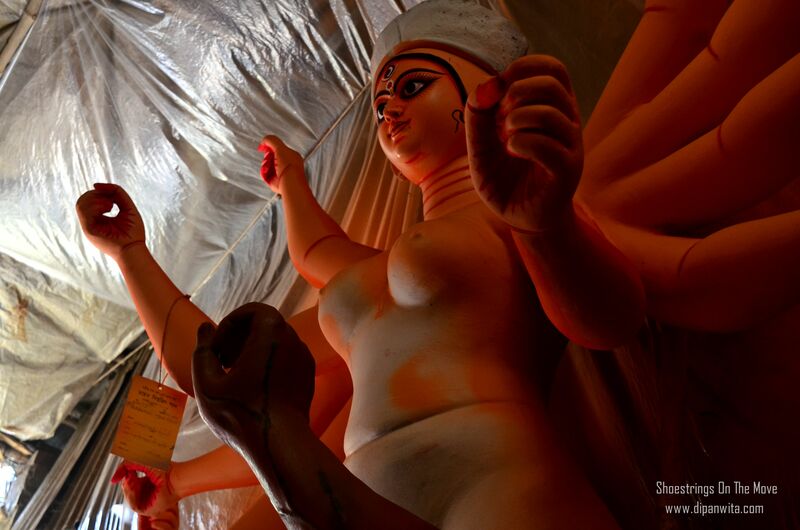 A worker is seen applying a thin cloth on the cracks developed on the Mahishasur idol. The cloth is dipped in another clay variation called “bele mati” (fine grained clay), a clay mixture of “etel mati” (sticky clay) and “Ganga mati” (clay from Ganga). At the backyard, another worker kneads the clay and the third man prepares the base coat for finished idols. 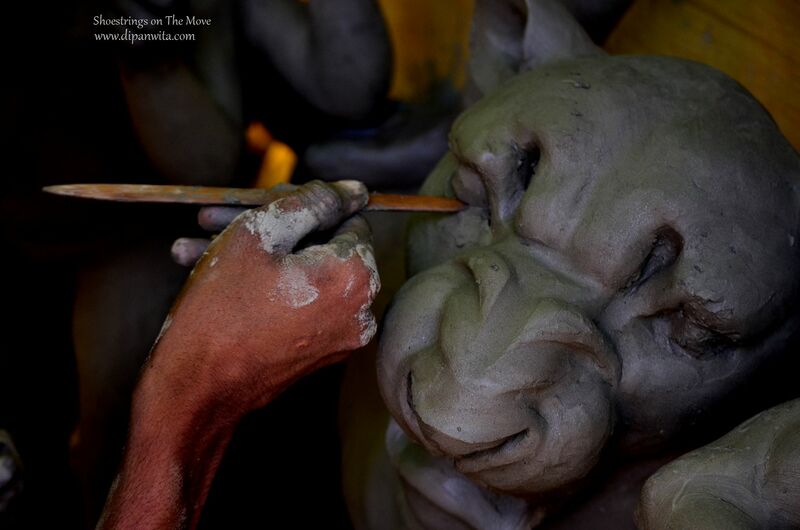 The eyes of lion are being sculpted by another worker using his “chiyari”, a sculpting tool made out of bamboo. They hardly have time for small talks and are busy finishing their work. Kumartuli is thronged with a great many workshops, most of them being rickety and dingy lined with rows of idols on either side. The workers live, cook and sleep inside the same workshops. 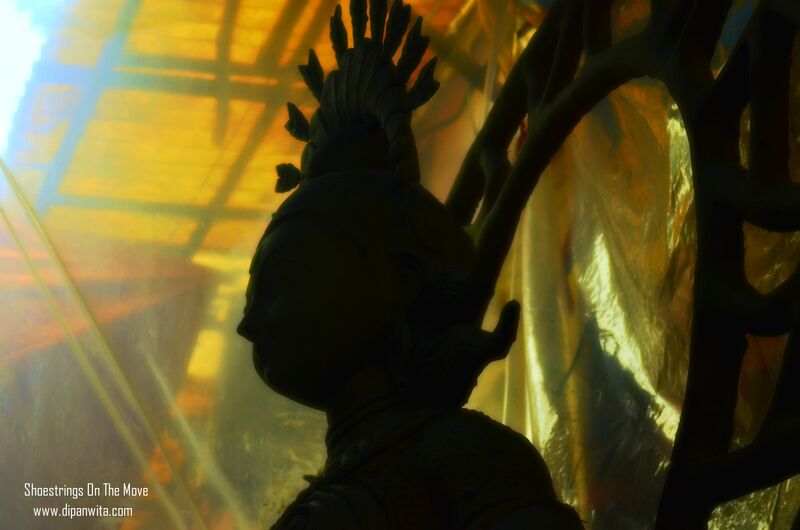 As the festival date nears, they work throughout night and day to make ready all unfinished idols. “They do get paid for all extra hours” mentions Pal. 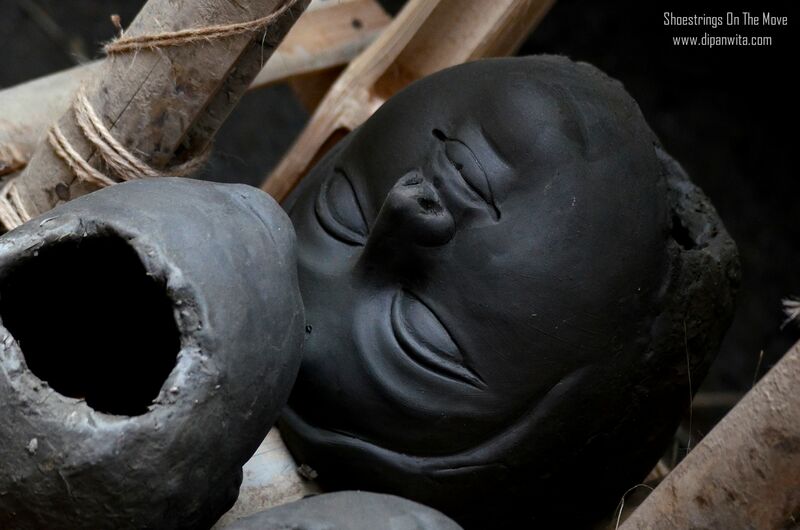 The history of Kumartuli goes back to 300 years when few potters migrated to Kolkata from Krishnanagar in Nadia district of Bengal, in search of better livelihoods. 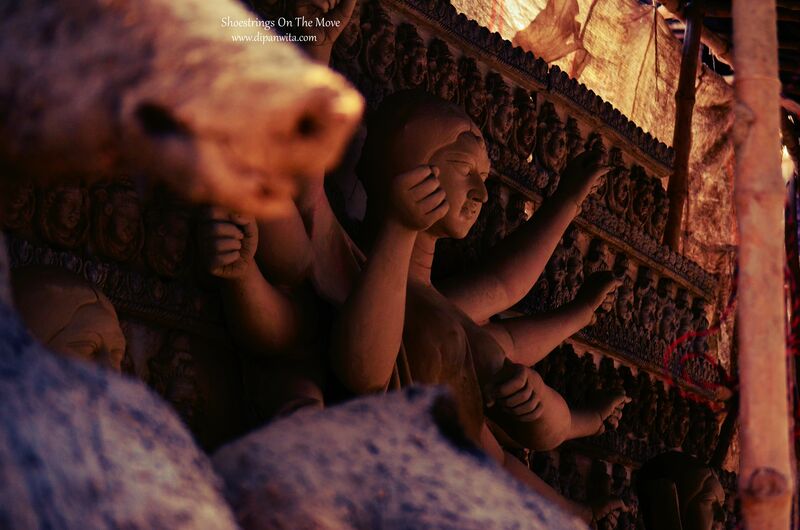 They were first hired by the then Raja Nabakrisna Deb to build a Durga idol to commemorate the worship of the deity. 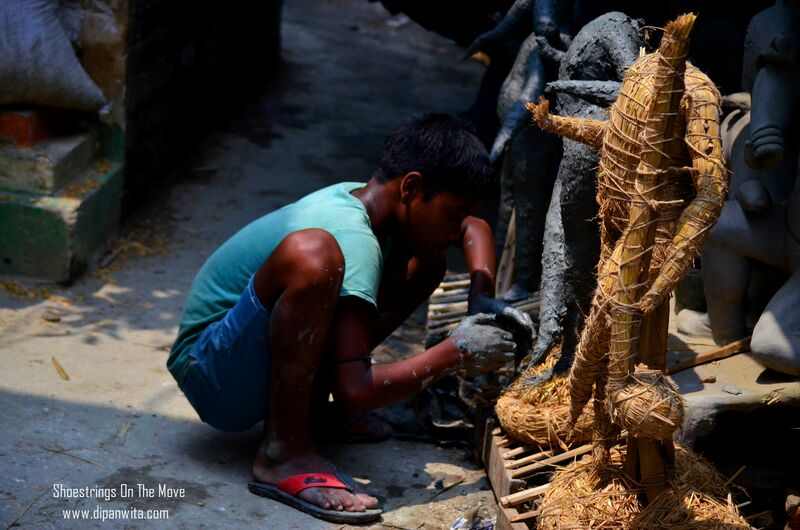 This marked the beginning of many zamindar households hiring potters to make idols for Durga puja. After the decline of zamindari system in 20th century, community puja took to the interests of people thereafter creating new opportunities for the potters. I spot one elderly artist applying color to the “sindoor daani” that would be placed in the hands of Goddess Lakshmi. On asking about the kind of colors used, he mentions that they make the colors themselves. Powder color is mixed with turpentine oil and “khai bichi” (glue prepared of tamarind seeds). This mixture allows the color to remain for longer time on clay. The sun is up and has already started burning but that doesn’t dampen the spirit of kumbhars in Kumartuli. I find them applying the second coat of clay with brush on the dry idols, some preparing base coat, some sticking hair on the ready idols with glue prepared from all purpose flour, some pasting towel- like cloth to the lion to get texture of the animal’s body appropriate, someone is preparing the accessories for idols, some sculpting the palms and feet. Somewhere, the snake hoods are left to dry and somewhere, the heads of idols are sun- bathing. 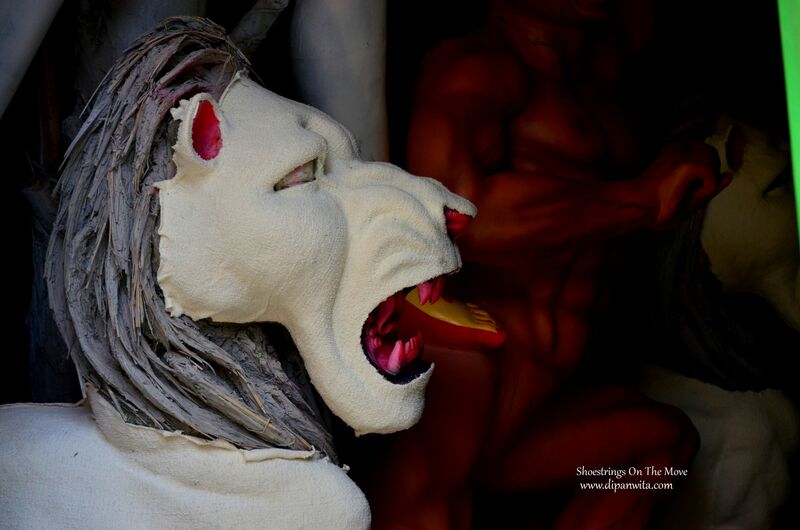 The entire essence that reverberates from surroundings of Kumartuli is overwhelming and it makes me little upset for having missed being in the city all these years during Durga puja. I can feel puja fervour in every atom of air here. 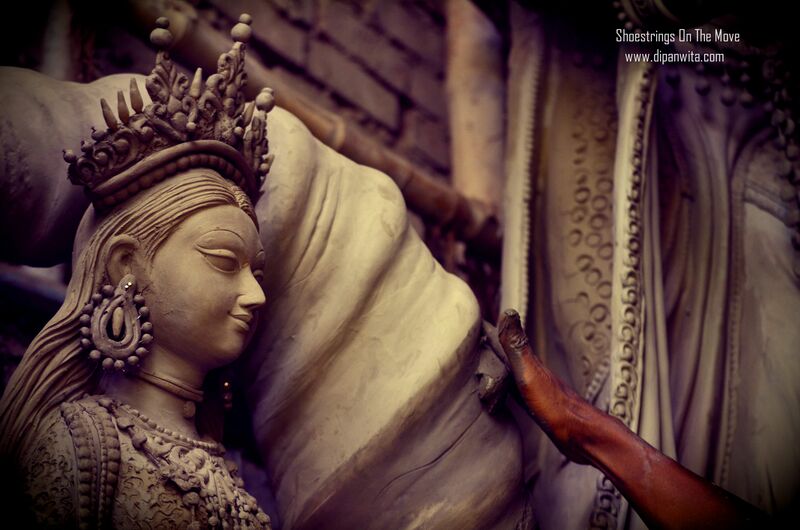 Dear Kolkata- I shall someday spend Durga Puja with you. It’s a promise. The nearest metro station is Sovabazar metro station. Kumartuli is 5- 7 mins walk from this metro station. Visit early morning to get better light exposure for your pictures. Have you experienced idol making process anywhere? Your post overwhelmed me with emotions of sheer fondness and nostalgia about our very own Durga Pujo and the remarkable idol makers. I live abroad and keep on missing this joy of celebration year after year. 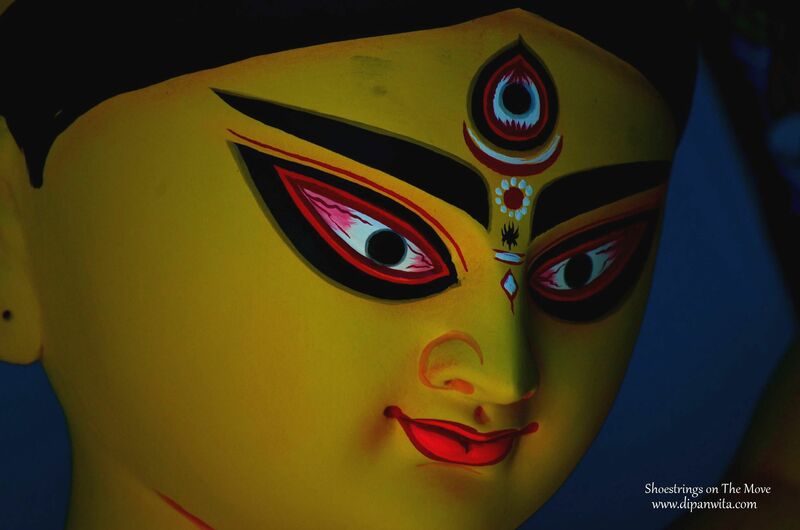 But I was fortunate enough to take a tour of Kumortuli while ordering fibreglass Durga Protima for our pujo in UK. And it gave me goosebumps. Thank u for reminding me the wealth of craftsmanship we treasure in our motherland. … once again. Hey Shree! I can relate to you on being nostalgic as the last time I was in Kolkata during pooja was around 12 years back. 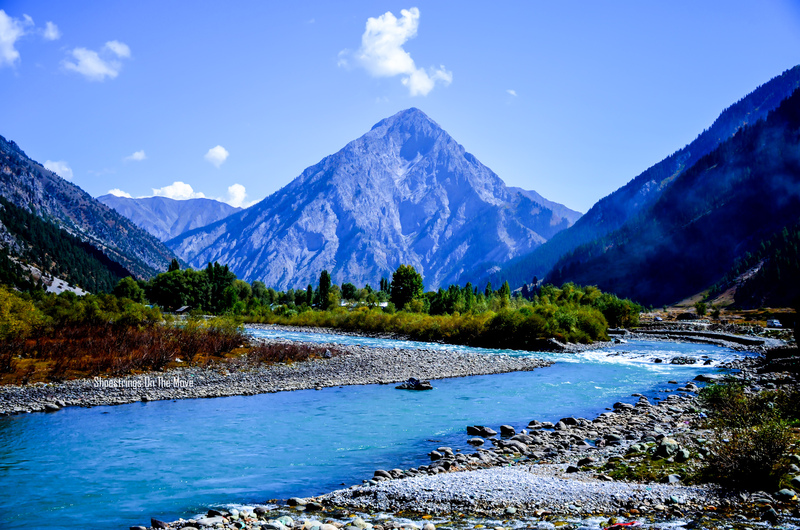 Our country is a treasure trove of rich culture and heritage and it really makes me feel proud. Wish you a happy and blessed pujo. Have a good time. 300 years !!? Gosh! And that it takes in so much of talent and precision. This post is so very fulfilling. 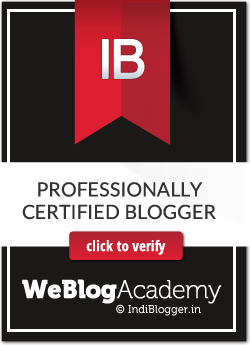 Great content and I heartily enjoyed reading this. So much to know about the world!! Even I wasn’t aware that the settlement was that old. I was amused when the artists revealed it to me. It feels so good to know about our culture and the lores attached. Everything was overwhelming and took a while for the feeling to sink in. Wonderful photography, Dipanwita!! 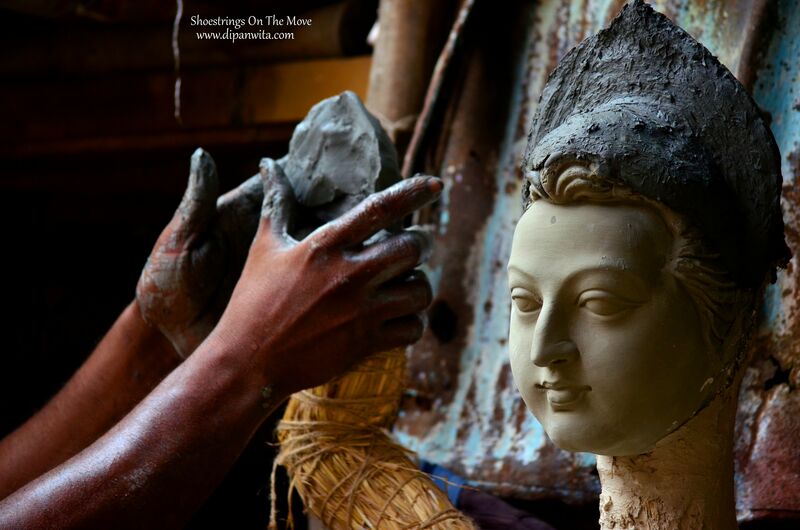 Kumartuli is still holding the tradition of idol making high up. There are eminent artists who export idols made of different other materials also. And, you are right, throughout the year, they are busy making idols of different Gods and Goddesses, their business through booms during this Durga pujo season. 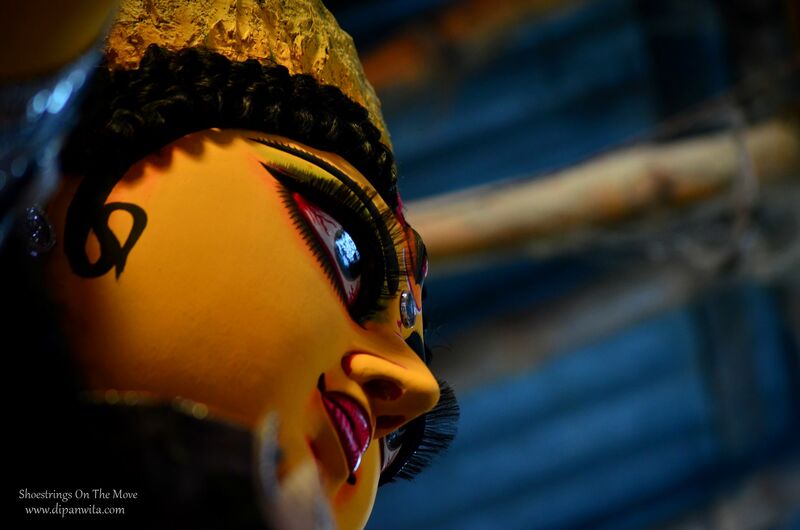 Surely missing Kolkata this tym for Pujo…. 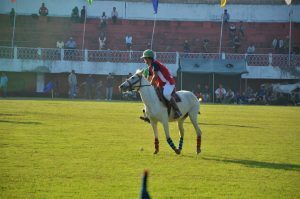 It is indeed a beautiful experience Ammu. So much work being carried out in those narrow alleys. 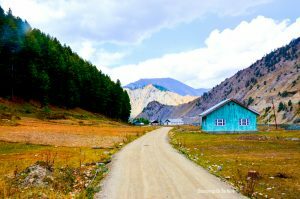 some stunning pictures with beautifully written post. Loved it…totally! While we don’t have something like that here in Jaipur, we do have large Bengali population engaged in jewellery industry. So there are many places where Bengali artists give shape to creativity. I created a post on that last year, will provide you link in next comment in case you want to check it out. Sounds good. Pls do share the link. would love to chk it out. Whoa this is a trasure trove of info on an aweosme cutom Dips!! 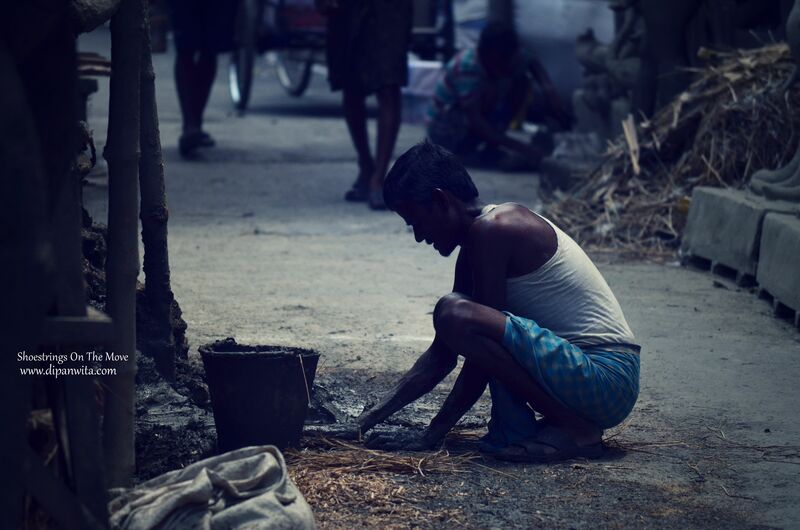 I loved trawling the lanes of Kumarhati with your lens – some splendid frames there! One Qs – are these water soluble/biodegradable idols? Thanks much Shalz! Yes the idols are water soluble and biodegradable as they are made of clay and straw.